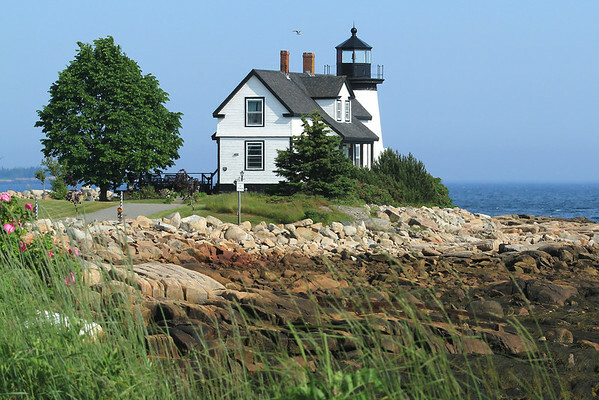 The light station at Prospect Harbor was authorized by Congress in 1847 and went into operation in 1850. At that time Prospect Harbor was home to a significant fishing fleet. The light was deactivated in 1859, after the United States Lighthouse Board claimed it was not needed because the harbor was not used as a shelter during storms. It was reactivated in 1870. In 1891 the station was rebuilt; the present tower and keeper's house date to this period. The brick oil house was added in 1905. The light was automated in 1934 but keepers remained on site until 1951, when its Fresnel lens was removed and replaced by modern optics. The station last underwent major restorative work in the early 2000s; it remains an active aid to navigation. The first tower built (in 1848) was a rubble-stone tower. This tower was replaced in 1891 by the present round wood-frame tower, which is 38 feet (12 m) in height and clad in wooden shingles. It is capped by a lantern house which is topped by a polygonal roof, and surrounded by a in iron walkway with railing. The door is on the north side, and there is a window on the west side. When built, a covered walkway joined the tower to the keeper's house, but this has been removed. The keeper's house is a two-story wood frame structure, clad in shingles on the upper floor and clapboard on the first floor. A porch extends across part of its front, with four square posts and slatted balustrade. The roof of the porch is a continuation of the main roof, and is pierced by a gable-roof dormer. The small brick oilhouse stands a short way north of the house and tower.